The Confederations Cup is a relatively new competition organised by FIFA and the first tournament took place in Saudi Arabia in 1992 and Argentina were the winners defeating Saudi Arabia 3-1 in the final. The next two tournaments also took place in Saudi Arabia. In 1995 Denmark won the final, 2-0 against Argentina and in 1997 it was Brazil's turn who in the final defeated Australia 6-0. The 1999 competition took place in Mexico with Mexico claiming the trophy after a 4-3 victory against Brazil. The 2001 tournament took place in Korea/Japan and France were the winners beating Japan 1-0 in the final. France hosted the 2003 tournament and were again the winners after beating Cameroon in the final with a golden goal. 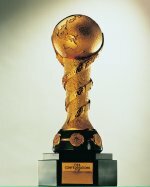 The draw for the 2005 tournament took place on 1 November 2004 in Frankfurt and it will take place in Germany starting on 15 June 2005 with the final taking place on 29 June 2005 in Frankfurt. Back to FIFA Competitions Menu For any comments or suggestions please e-mail to webmaster@takisonline.com Copyright © 1997-2003 Christakis Ioannou. All rights reserved.